The LeWL Windlogger is designed primarily with one specific application in mind: long-term logging of wind speed and direction data. As a result, its purpose is different from the AWS systems described in other pages on this site, which are typically used for real-time display of weather data or for relatively frequent data uploads to linked PCs. 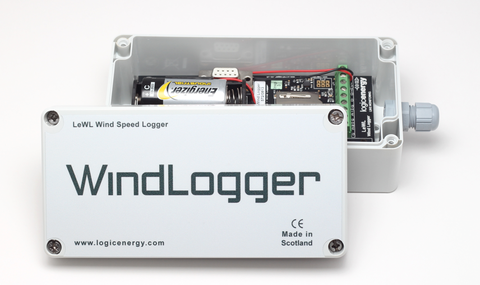 The LeWL Windlogger, in contrast, is essentially an offline only device; the logger itself is installed outside at the survey site and its data only accessed when its memory card is detached from the logger and inserted into a PC, which might be scheduled to be done on eg a monthly basis (or indeed less frequently). 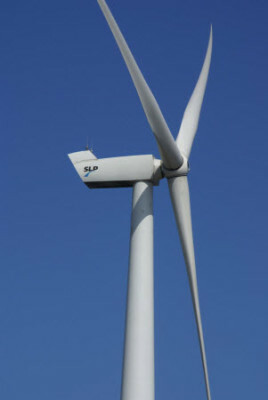 Applications for this logger are discussed on our Renewable Energy Surveys advice page. The LeWL Windlogger is an ideal and highly cost-effective solution where a requirement exists for unattended logging of wind data over a period of months and years, most typically when surveying a site for possible wind turbine installation. Any compatible anemometer may be used with the LeWL Windlogger but we recommend using a Davis 6410 anemometer to provide the optimum balance between performance and affordability. This anemometer also provides readings of both speed and direction. The Davis 6410 model is the anemometer supplied with our LeWL bundles. Data are logged to an internal SD memory card, which acts as a transportable storage medium. Each individual data file contains one day’s (10 sec interval) or one month’s (1 or 10 min interval) worth of logged data in a simple comma-separated variable (CSV) text file with one record per line. This format can be readily imported into standard spreadsheet programs and the exact data format is shown in the logger documentation.